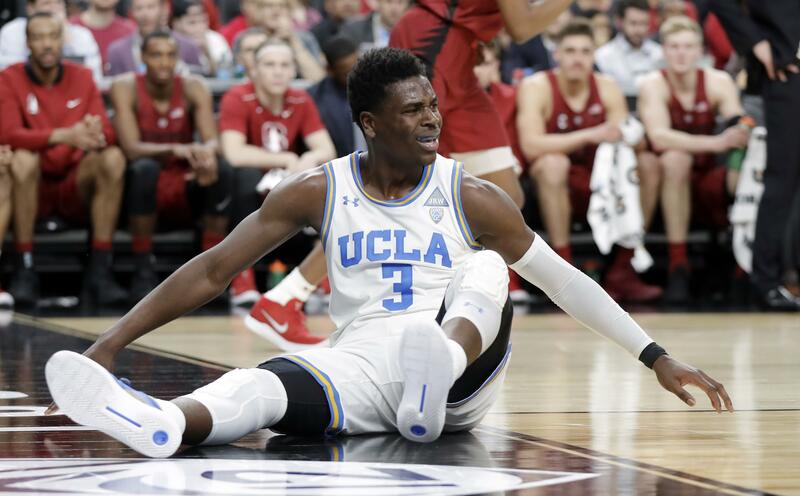 LAS VEGAS – Aaron Holliday had 34 points, eight assists and seven rebounds, lifting UCLA to an 88-77 victory over Stanford in the Pac-12 Tournament quarterfinals on Thursday. Holliday and Thomas Welsh carried most of the load, leading the Bruins into Friday’s semifinals against No. 15 Arizona. Welsh had 18 points and 11 rebounds. Holliday made 12 of 25 shots, including 5 of 9 from the 3-point arc. Stanford (18-15) pulled within four by halftime but never could make up the ground with point guard Daejon Davis in foul trouble. The Cardinal rolled over rival Cal in the Pac-12 first round and beat the Bruins by 16 at Westwood in the teams’ last meeting. UCLA won the first game in double overtime. UCLA led 44-40 at halftime after Holliday scored 17 points. Holliday and Welsh carried UCLA in the second half, helping them stretch the lead to 71-63 with seven minutes left. Davis went to the bench with his fourth foul 66 seconds into the second half, preventing the Cardinal from making much of a run. Published: March 8, 2018, 5:14 p.m.